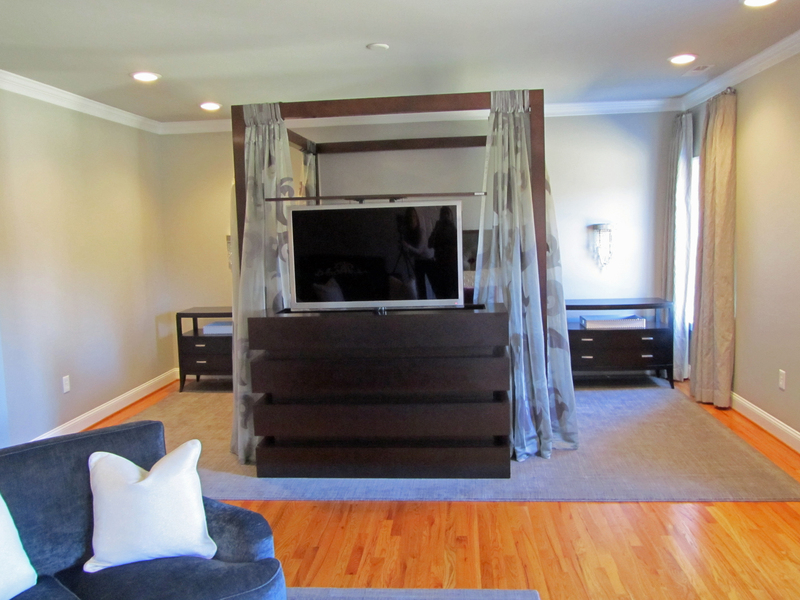 It’s sad but true that the TV has become one of the major elements to consider when designing rooms these days. TVs are often a main focus in family rooms, master bedrooms, basements and even other areas of the house like bathrooms and offices (how do you get work done with the TV on?). 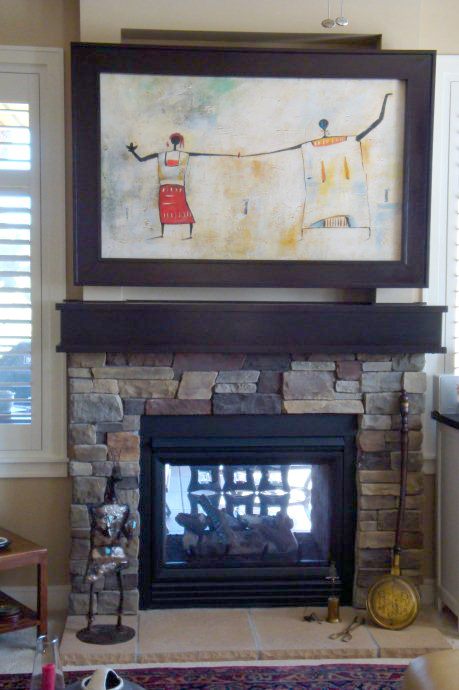 TVs are also growing wider, which impacts the visual space of the wall it is on and the balance of the room as a whole. With the advent of technology where TVs no longer are as deep as they are wide, we have way more options for housing the TVs components–people seek out sleek, minimal media storage cabinets that are stylish and less bulky. 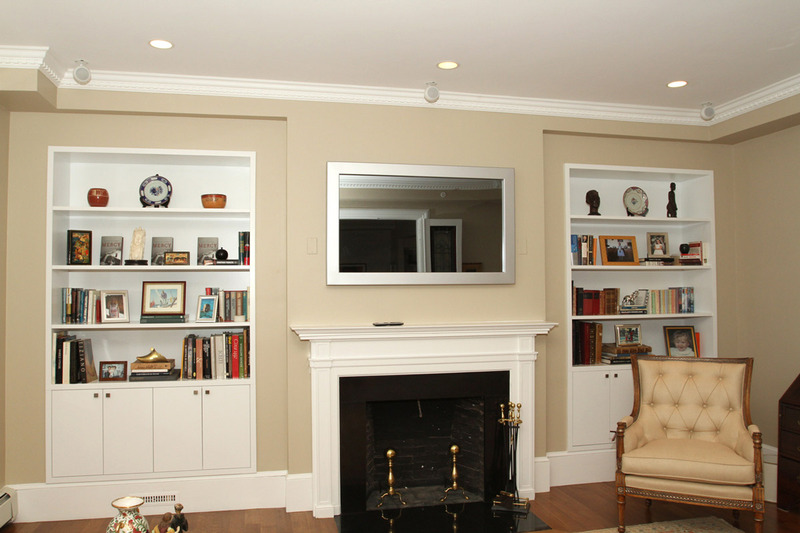 With more compact TV cabinets that don’t necessarily house the TV itself, comes the issue of covering up or lessening the visual impact of your TV on the room when it is not in use. 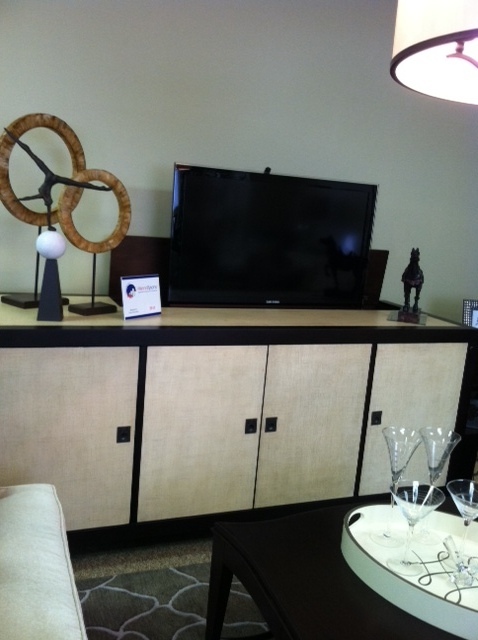 Luckily, there are a few good resources to turn to if you’d like to downplay or conceal your TV. 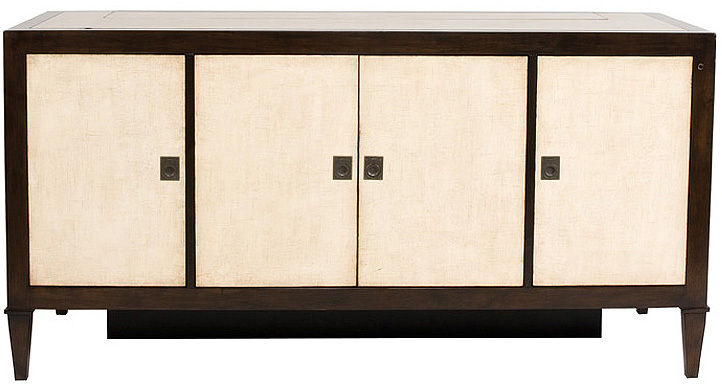 One of my favorite ways to hide a TV is with a TV lift cabinet. We installed a TV lift cabinet in our new design studio and selected one for our professional baseball player client who has one in his master bedroom (hint: he is a starting pitcher for the Detroit Tigers who is having one of his best years ever!). One of the pros to a TV lift cabinet is that your TV is literally stored away when it’s not in use. At the foot of a bed, for example, this is a great option because it appears as if no TV is there when it is lowered. And, lift cabinets are great in rooms where there is little wall space, where the TV must sit in front of a window or in small spaces where the TV may need to be floated into a room to divide up the space. Many lift cabinets also have a 360 degree feature, where you can rotate the TV around to face a different area of a room. I like having the TV lift in the studio because it is hidden and out of sight. There is also the convenience of having a remote control lift and rotation, so there is no need to get up to raise and lower the TV, or pivot it. If a lift cabinet isn’t a good fit for your needs and just want to ‘dress up’ your wall-mounted unit, you could just cover it with a mirrored frame or canvas that makes your TV look like wall decor when it’s not in use. 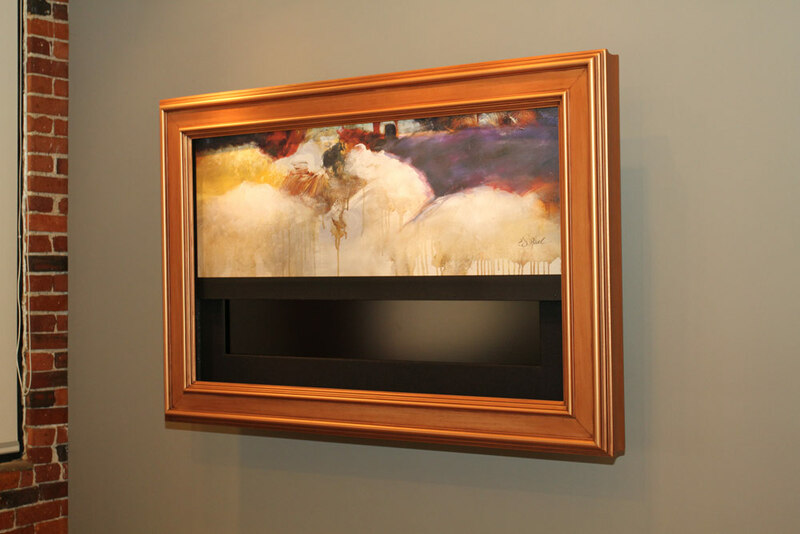 Framemytv.com is a great, easy to use website that shows many ways to cover up the TV, the main ones being with motorized artwork or a see-through mirror. 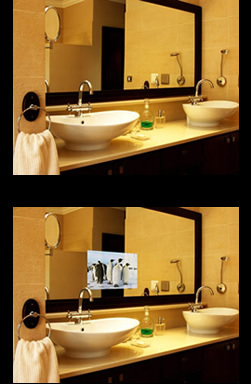 Another amazing technology I am obsessed with these days is television mirrors, where the TV projects onto a mirror like in a hotel bathroom. I saw one of my friends post this on Facebook last week and think it’s the coolest thing!! 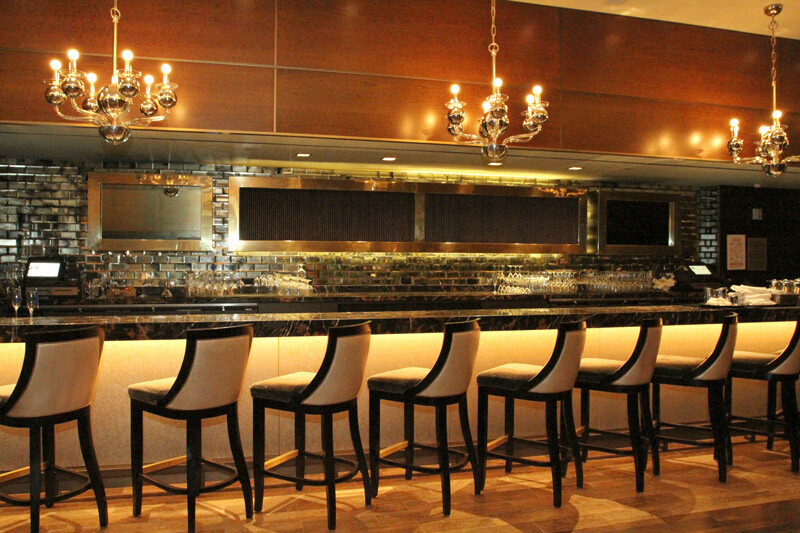 I hope I have given you some ‘food for thought’ in deciding how best to dress up the TVs in your home and office. Have a great weekend! ← Pink and Oh So Pretty!!! Oh wow. I was bookmarking like crazy throughout this post. Some day later this year, I don’t know when, but I would love if you would guest post this post for me on BeColorful. I know my readers would enjoy it and you. I would love that!!! I need to start having guests as well, so maybe you can do the same here. Isn’t this TV stuff cool? I can’t wait to share some projects we are working where we are doing the mirrors and artwork wraps. Thanks so much for stopping by and for your comment. Keep them coming and definitely let me know when you want me to be a guest. I would love that!